Description: James Buchanan Duke is depicted as larger than life standing atop an octagonal plinth or pedestal of polished dark granite. He is shown holding a cigar in his left hand, possibly a reference to the fortune he earned in the tobacco industry, and the tilt of his cane suggests that he is in motion. The eight foot tall statue sits on a four inch thick base atop the plinth. The entire structure sits on a low, two tier octagonal granite base. Unveiling & Dedication: The unveiling occurred at 12:15 pm on the final day of a three day commencement celebration in 1935. The activities that day included a commencement address given by President Glenn Frank of the University of Wisconsin, an alumni luncheon, presentation and acceptance of the Duke Homestead, and graduation exercises. James A. Thomas, the chairman of the Duke Memorial Association, spoke of Duke's generosity and love for his state and the city of Durham, and Mary Duke Biddle pulled the cord to reveal the statue. Several thousand people attended the ceremony and listened as Colonel John F. Bruton made an acceptance speech. President W. P. Few also participated in the ceremony. Subject notes: James Buchanan Duke, the son of tobacco giant and philanthropist Washington Duke, established the Duke Endowment in 1924 with a donation of $40,000,000 to Trinity College. Like his father, James B. Duke earned his fortune in the tobacco industry, continuing in the family business after his father's death. He also entered the power industry with his older brother. The donation was intended to rebuild East Campus and build a new complex on West Campus. After this generous donation, the school changed its name to Duke University. 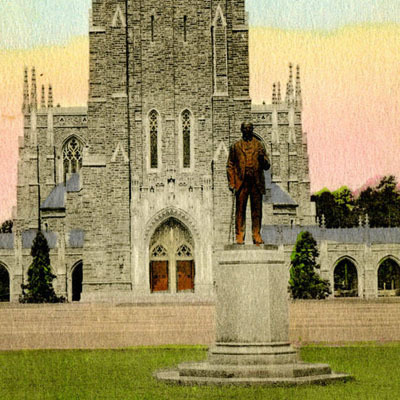 Location: The statue sits in front of Duke Chapel on the West Campus of Duke University. It faces southeast into the quad and traffic circle. 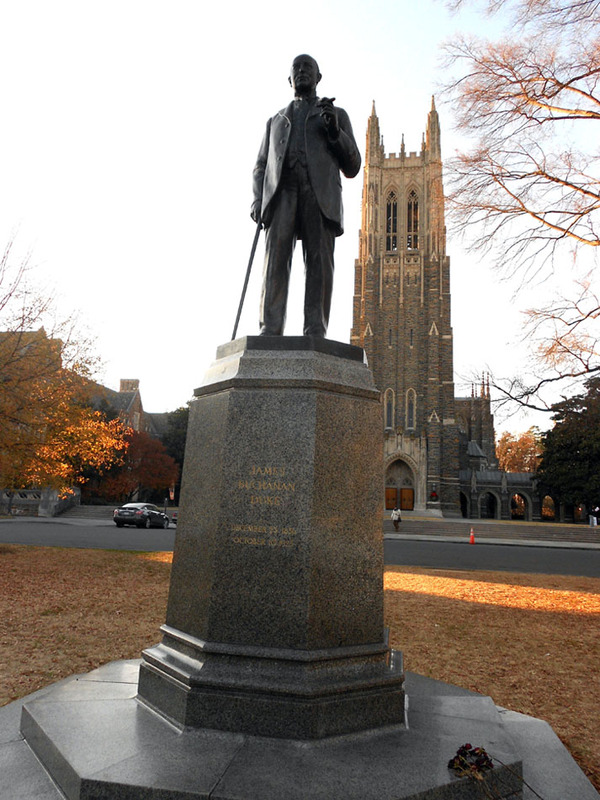 Landscape: The statue is situated in a grassy quad, just before the steps to Duke Chapel.